Shreveport is located on the west side of the Red River, opposite Bossier City, in the northwestern section of Louisiana, some 30 miles south of Arkansas and 15 miles east of Texas. A portion of the city is situated in the Red River bottom lands and the remainder in gently rolling hills that begin about 1 mile west of the river. The NOAA National Weather Service Office is at the Shreveport Regional Airport, about 8 miles southwest of the downtown area. Elevations in the Shreveport area range from about 170 to 280 feet above sea level. 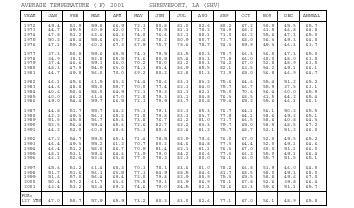 The climate of Shreveport is transitional between the subtropical humid type prevalent to the south and the continental climates of the Great Plains and Middle West to the north. During winter, masses of moderate to severely cold air move periodically through the area. The spring and fall seasons are usually mild, while the summer months are consistently quite warm and humid with high pressure and a moist southerly flow being the dominant feature. Rainfall is abundant with the normal annual just over 46 inches, with monthly averages ranging less than 3 inches in August to more than 5 inches in May. 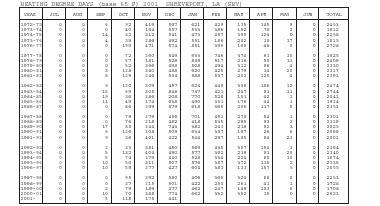 The average growing season for northwest Louisiana ranges between 230 and 240 days in length. The majority of rainfall is of convective and air mass types–showery and brief–except during winter when nearly continuous frontal rains may persist for a few days. Extremes of precipitation occur in all seasons. 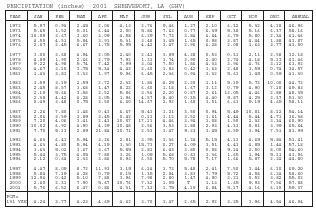 While torrential rainfall is the exception in the Shreveport area, some heavy rainfall events of notes are 12.44 inches in a 24–hour peroid on July 24–25, 1933, and 19.08 inches over a three–day peroid on July 23–25, 1933. The July 1933 total of 25.44 inches was the greatest monthly total. 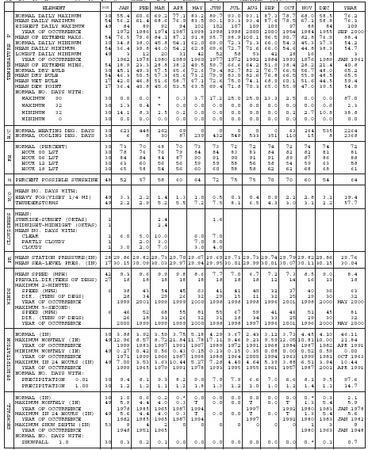 The greatest annual rainfall of record was in 1991 with 81.99 inches, and the driest year of record was 1899 with 23.10 inches. 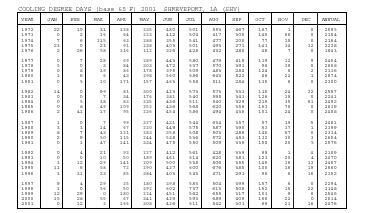 The months with the fewest days of rain are August and October, with August having the least average precipitation. The winter months are normally mild with cold spells generally of short duration. The typical pattern is turning cold one day, reaching the lowest temperature on the second day, and a warming trend on the third day. The coldest reading on record is −5 degrees F on February 12, 1899. Temperatures of freezing or below occur each winter with an average of 39 days during the year. Temperatures drop below 15 degrees F only about one out of every two winters. The average date of the first 32 degrees F in the fall is November 15 and the average date of the last freeze in the spring is March 10. Freezing temperatures have been recorded as early as October 19 and as late as April 11. Temperatures recorded at the NWS Office on clear, calm nights are normally 2 to 5 degrees warmer than those in the low–lying river bottom lands of the area. Measurable snowfall amounts occur on an average of only once every other year; many consecuitive years may pass with no measurable snowfall. 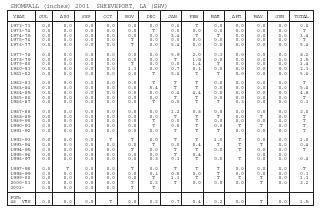 The heaviest snowstorm of record in the Shreveport area is 11.0 inches in december of 1929. This fell on the 21st and 22nd, and one–half inch remained on the ground December 25th, making this the only Christmas Day of record with snow on the ground. In 1948, 12.4 inches of snow was measured for the month of January for the greatest monthly amount on record. Occasional ice and sleet storms do considerable damage to trees, power and telephone lines, as well as make travel very difficult. The summer months are consistently quite warm, with maximum temperatures exceeding 100 degrees about 6 days per year, exceeding 95 degrees about 32 days per year, and exceeding 90 degrees about 87 days per year. The highest temperature on record is 110 degrees F on August 18, 1909. Showers and thunderstorms at any one location in the area give about eight days in a month of measurable rainfall. The resulting point rainfall totals are usually less than one–half inch except on two or three days per month when heavier amounts are recorded. Thunderstorms occur each month, but are most frequent in spring and summer months. The showers and thunderstorms during the spring and autumn months are most often produced by squall lines and fronts, and are generally heavier than the air mass showers which occur in the summer months. Severe local storms, including hailstorms, tornadoes, and local windstorms have occurred over small areas in all seasons, but are most frequent during the spring months, with a secondary peak from November to early January. large hail of a damaging nature is infrequent, although hail as large as grapefruit fell in March 1961, and baseball size hail fell in May 1974 and April 1995. The average relative humidity is rather high in all seasons. These high humidity values may be experienced at any hour but occur mainly during the early morning hours, with two–thirds of the hours shortly before sunrise having relative humidity of 90 percent or higher. In contrast, more than half of the mid–afternoon hours have had relative humidity values of less than 50 percent. Tropical cyclones are in the dissipating stages by the time they reach this portion of the state and winds from them are usually not a destructive factor. rainfall accompanying these systems can be heavy and can contribute to local flooding. I'm not quite sure how to say this; you made it etxremely easy for me!